Gabon is one of the richest countries on the African continent. The economic situation of the country has a favorable effect on the telecommunications sector. Mobile penetration reached 192%, with a population of more than 2 million people. The well-developed sector of cellular communication and high mobile voip call rates ($0.11- $0.22 per minute) create good conditions for profitable GSM termination. In 1999, Gabon liberalized its telecommunications market. Then three mobile operators - Airtel, Libertis, and Moov were licensed. Due to the high competition among mobile companies, Gabon became one of the first African countries to exceed 100% of mobile penetration. In 2009, Azur, another GSM operator entered the market, after which the price war began. The result was a reduction in tariffs on cellular communications. In Gabon, SIM-cards can be bought both in the salons of communication and from street vendors. The cost of one starter package is about 90 cents. The standard rate for local calls is about $0.2 per minute. However, thanks to the numerous bonus offers of operators, it is possible to make calls for $0.08 per minute and cheaper. Originators pay between $0.11 and $0.22 to terminate one minute in this direction, depending on the operator. 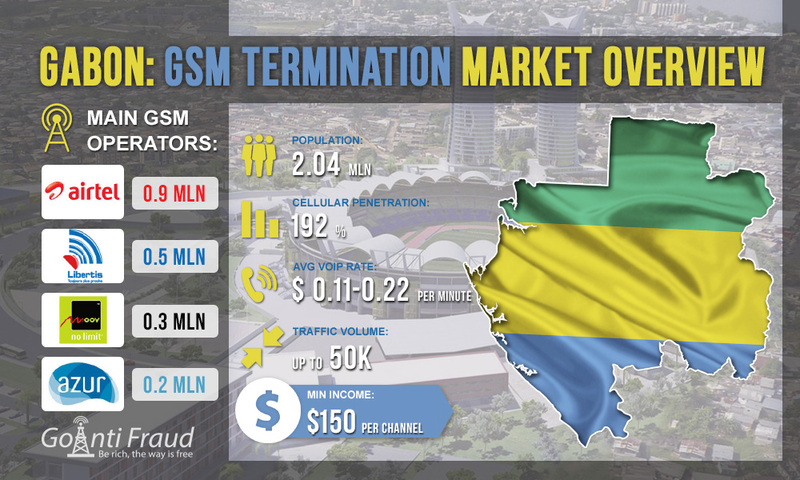 If you are going to terminate Airtel's traffic in Gabon, you can earn an average of $0.21 per minute, Azur and Moov traffic $0.22, and Libertis $0.11. Consequently, by terminating 5 hours a day with a minimum set of VoIP equipment, you will get an income of $150 from each channel.